November is my worst month of the year. It’s the longest time to go before Spring appears, Summer seems miles away, December has the promise of Christmas – one thing however brightens up November…my Fridays with Max. He arrived today as he arrives every Friday with a big smile that is like a ray of the bright summer sun. he gives me a massive hug and a kiss and then we always sit down together to break the day in slowly. Today the lady of the house was out to work almost as soon as Max had arrived. Max waved goodbye. She had however given us a job for today which will guide our adventure. We are to drive to the north of Cardiff to pick up some very important presents. Max enjoyed the journey up watching some train videos thanks to my new gadget. It also gave us the chance to get Elsie on our family pebble picture. We were happy about that. While the lady kindly added Elsie, we had a couple of hours to while away so I thought I would share with Max some places of my childhood. I don’t know if Max will remember this day when he is grown up enough to read this, he probably won’t, but at least he can see he spent the day treading in my footsteps of long ago. I want him to know what a lovely childhood I had. After we had dropped the picture off, we made for the house where the lady of the house grew up – Waun y Groes Road in Rhiwbina. It’s quite posh in Rhiwbina and I was from the neighbouring council Estate. It’s true to say I probably married above my station. It was a bit like the song Uptown Girl by Billy Joel. 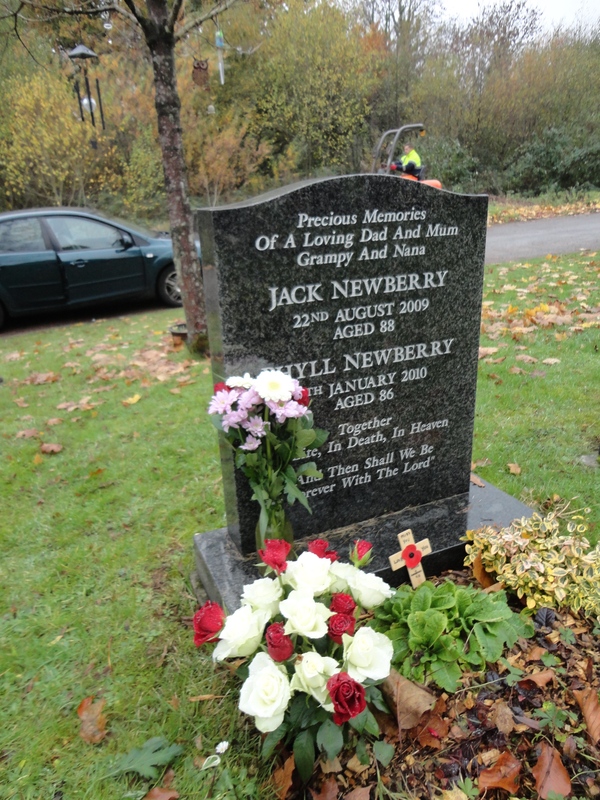 It was a lovely place to grow up and Max’s gran had a lovely childhood and parents who loved her sacrificially. Tragically her dad died when she was just eighteen. Life seems so unfair sometimes. Her mum, Beatrice rose to the challenge and loved her three children and worked herself to a standstill to provide for them. I think Max loved the house. From here we moved on to the place where I grew up. I was actually born in Grangetown in Cardiff in the front room of 205 Penarth Road, where my parents rented some attic rooms in the early days of their marriage. We moved to Llanishen in 1952 into a brand-new house built as part of the post war building programme. It was an idyllic lace to grow up. Council estates in the 1950s had big back gardens and grass verges between the pavement and the road. The local History Society tells me this…. Llanishen has a rich history stretching back over 1,000 years. In A.D. 535 two monks set out eastwards from the then-small settlement of Llandaff, aiming to establish new settlements, or “llans”, in the wild terrain below Caerphilly mountain. One of these monks, Isan, established his “llan” on the present-day site of the Oval Park, an ideal location offering a ready fresh-water supply at a natural spring and the nearby Nant Fawr stream. “Llan-isan” remained a peaceful place until the arrival of the Normans. In 1089, a large and bloody battle, the Battle of the Heath, was fought to the north of the settlement. Crushing the Welsh resistance at this battle and gradually securing their hold on Wales as a whole, the Normans began to expand Llanishen, commencing work on a church at a site on higher and drier ground to the north of the old settlement. This church was completed sometime in the 12th century and was dedicated to the now St Isan. Despite the many upheavals in Britain in the following centuries, “Llan-isan”, which gradually became corrupted to Llanishen, stayed a quiet rural village whose principal occupation was agriculture. This only changed significantly in the mid-nineteenth century when the area came under the gaze of the Rhymney Railway Company. Seeking to build an alternative route to Cardiff Docks to rival that of the mighty Taff Vale Railway, the company was granted parliamentary permission to create a new line running from Caerphilly, through Llanishen, to Cardiff. In order to do this, the company first had to blast its way through Caerphilly Mountain, creating a tunnel some one and a half miles in length. Unsurprisingly, in an age before health and safety of any kind, accidents were common, and a large incident inside the tunnel cost the lives of several of the railway “navvies”, some of whom were buried in St Isan’s churchyard. The line gradually marched through the village along a large embankment, work being completed around 1871. The advent of the railway had a marked effect on Llanishen. Wealthy residents of Cardiff could now move out into the “country” and live in the pleasant surroundings of the village, while still being able to commute into the then-town from Llanishen station. In the twenty years between 1851 and 1871, the village’s population rose by over 20,000. 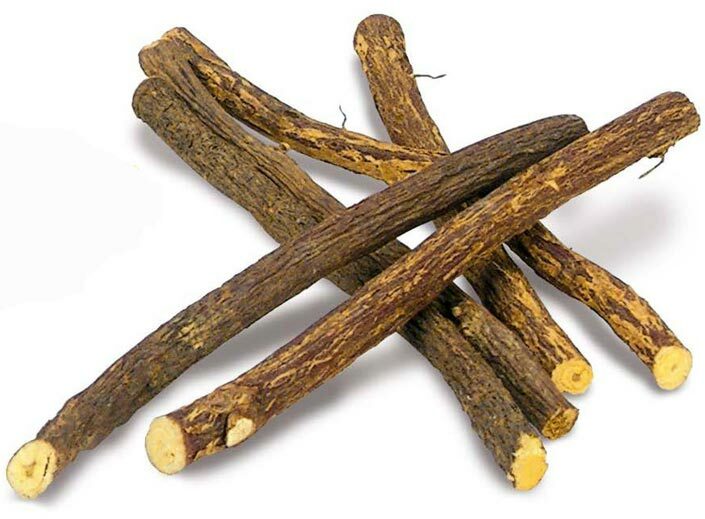 It was a trend that was set to continue. In 1887, after a long period of negotiation, two reservoirs were built in the village to support the rapidly growing population of Cardiff. By 1922, after continued expansion, Llanishen became a suburb of Cardiff. As with so many towns and villages throughout the country, the outbreak of war in 1914 was to leave its grim mark on Llanishen. The war memorial inside St Isan’s church testifies to this with a long list of men who did not return. Among these was Lt. Col. Frank Hill Gaskell, who after being wounded in 1914, returned to Cardiff to help raise the 16th Cardiff City Battalion. Leading it back to France in May 1916, he was killed when a German bullet struck his ammunition pouches, causing an explosion that left him mortally wounded. The coming of the Second World War was, however, to have a far more overt effect on Llanishen. In 1939 the government established a Royal Ordnance Factory along Ty Glas Road. The factory produced tank and anti-tank guns with a largely female workforce and was highly productive. In the nearby fields, anti-invasion defences were erected to try and ward off the feared German paratroopers. When the threat of airborne invasion gradually began to decrease in 1941, the RAF established itself on the site, clearing the defences to use the wide-open spaces to train Air Cadets in the rudiments of flying in rickety training gliders. This is where the area’s modern name of “Glider Field” stems from. The old glider field became the home of Llanishen Leisure Centre, while the surrounding farmland and market gardens were replaced with industrial and buildings. The majority of these have since been replaced, particularly the ROF complex, and the area is now occupied by the Llanishen Business Park and a large area of housing. In spite of all this change however, Llanishen has retained its village feel, with its bustling heart being focused around the old village centre and St Isan’s Church. Going back to Llanishen is always good, I have so many happy memories. We parked near my old house and Max was ready to get out and have a look. Thankfully, it appeared the current owners were at work. Max had no idea where he was but appeared so excited! One thing I noticed was the disgraceful state of the roads – they were awful. Together we walked to the shops, the short journey I took probably thousands of times. I remember once my sister was entrusted with a ten-shilling note (50p today) to get some shopping and she lost it. My mother was sad and upset for days. It was a lot of money for her to lose in those days. When I was a boy the shops were brilliant. 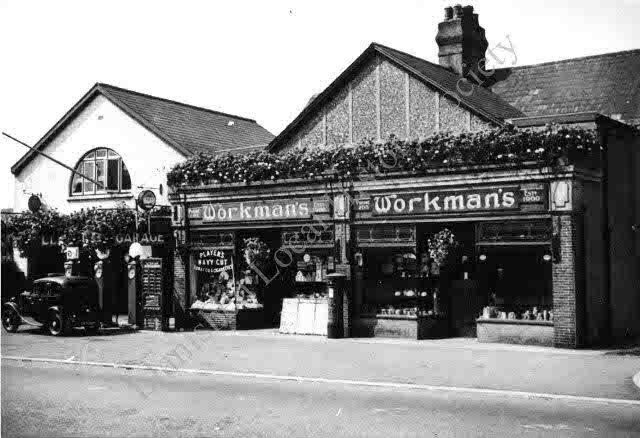 There was Hamilton’s the Greengrocers, Wally’s the sweet shop and paper shop. Patterson’s the Butchers and Ablett’s the Grocers. 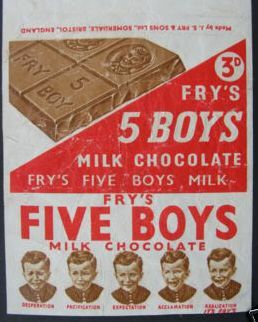 Wally’s was the centre of our world and we got to spend our pocket money there on sweets – Fry’s Five Boys chocolate, sherbet fountains, Sweet peanuts and liquorice roots, bits of sweet tasting wood. The Hamilton’s were a sort of rough and ready sort family, Stuart was my friend. Wally had a big row of stitches across his neck – his name was Bafico. – maybe he was Walter Bafico? The Pattersons were just ordinary but friendly and the Abletts were great. Joe Ablett always wore a white coat and had a bacon slicer and an adding machine – no calculators then – with a handle he pulled down after adding each item, we were spellbound as kids. His wife was a posh lady who always wore fancy glasses. When Max and I got to the shops, I was so sad. All the shops had morphed into one shop – Fishguard Road Stores. All the others were shuttered up. I peered through Wally’s window and it was just a mess. It looks like Fishguard Road Stores may be taking it over. After Wally’s it became Shah’s and Mr Shah ran the post office and was extremely kind to my parents, they loved him. 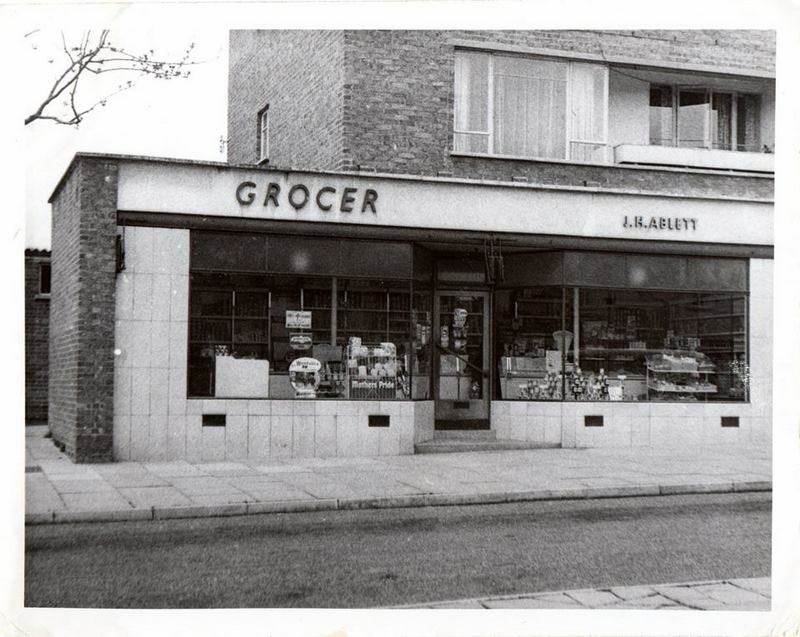 There was one more shop, Abletts had been split in two and the one end was a barber shop. I was happy to see that. When I was young Mrs Preece was the local hairdresser, she lived in Heol Merlin. We went to her front room to be done and she charged 1/3d – probably about 6p today. Max had his hair cut last week and was charged £10. 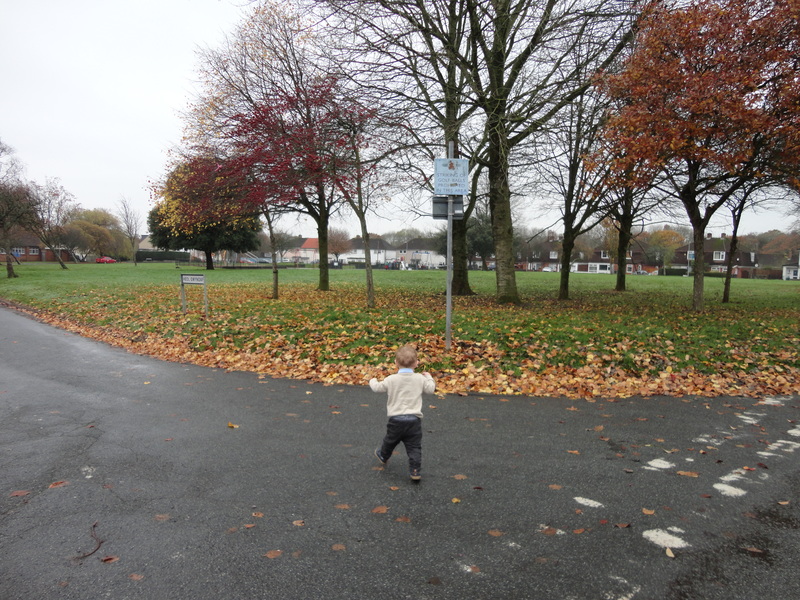 Max and I walked around past the shops and up Portfield Crescent to the park. When we first moved in the park was a patch of rough ground which the council turned into a park. In the sixties it had its own Park Keeper, a grumpy old fellow that we used to tease unceasingly. Max was longing for a play, but dank November days are not the best for playing in parks covered with leaves. Next, we strolled to my old church, Llanishen Evangelical Church. It’s where the lady of the house and I did a lot of our courting. We made many wonderful friends there. When the estate was built the council set aside the plot of ground for a place of worship and my parents were the original members. 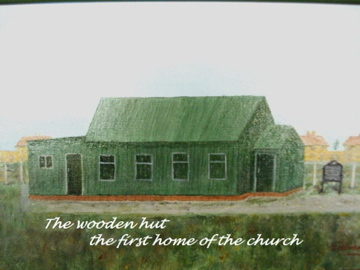 The church began with a tent, then a wooden building and then the current building in 1958. My dad and a few friends bought the building from a hillside in Bedlinog, dismantled it, brought it to Llanishen and rebuilt it. It was heated by paraffin stoves which glugged their way through every service. After visiting the church, we decided to walk ‘up the gully’. This is a path from the estate to the posher houses on Fidlas Road. 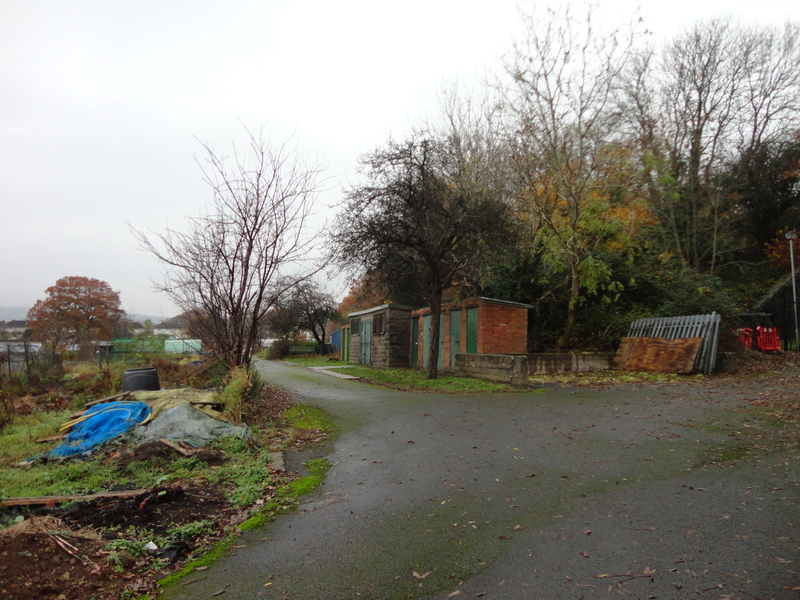 On the left are the allotments where my dad sued to have a plot. He grew a lot of our vegetables while we were growing up! Max loved this he was excited all the way. As children we walked this path to school every morning. 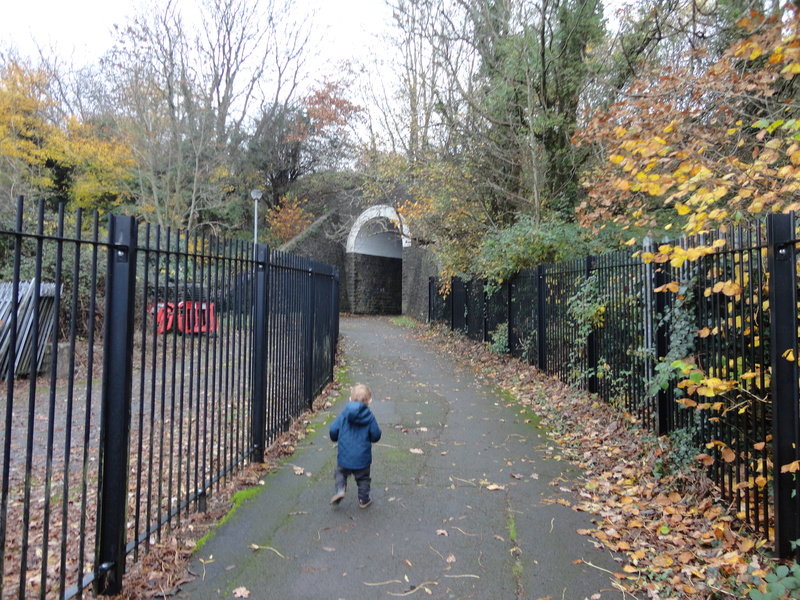 It leads past the allotments through a big railway arch and onto Fidlas Road. Its where we used to catch the bus – 28 or 37. 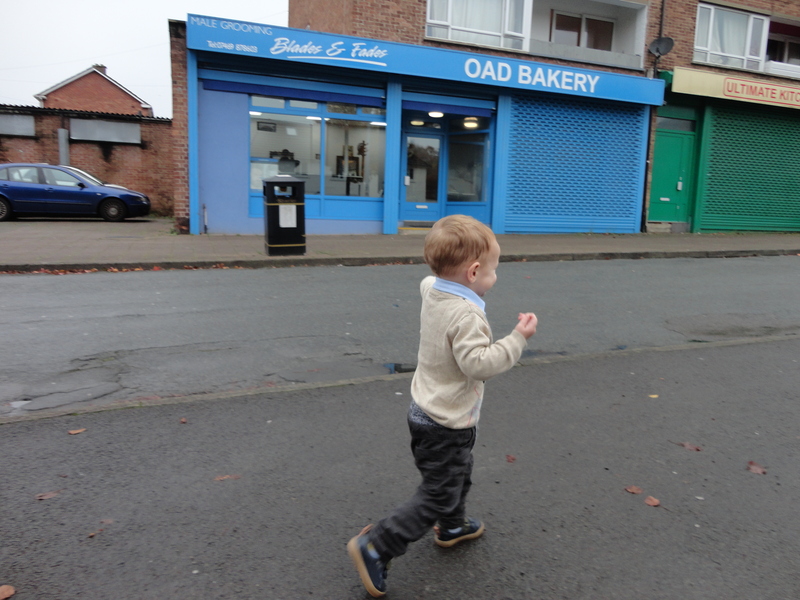 The 37 took us to Grangetown, where we visited our nanna. If we visited my dad’s parents, we would have to catch the 28 or 37 to town and the catch a 10B Trolley bus to Ely. 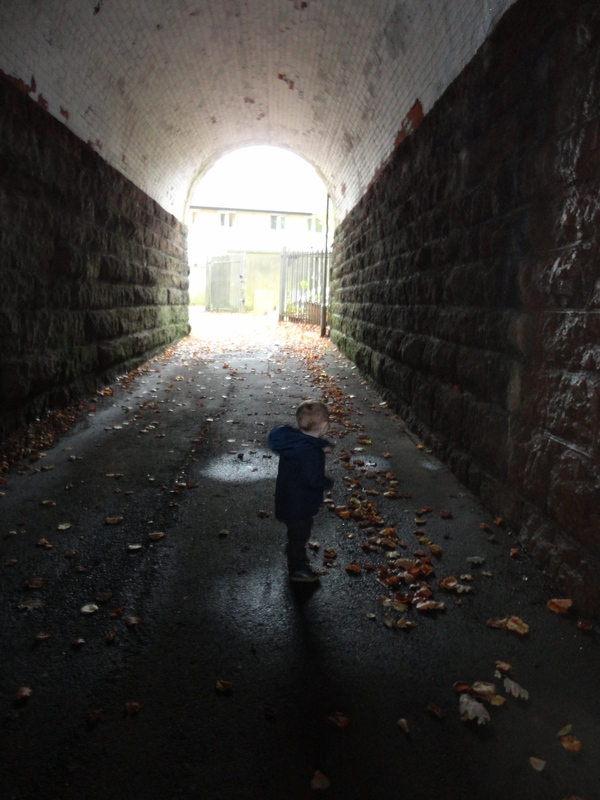 Max particularly loved the tunnel. He paused at the entrance looked and smile before shouting loud, loving his echoey voice. 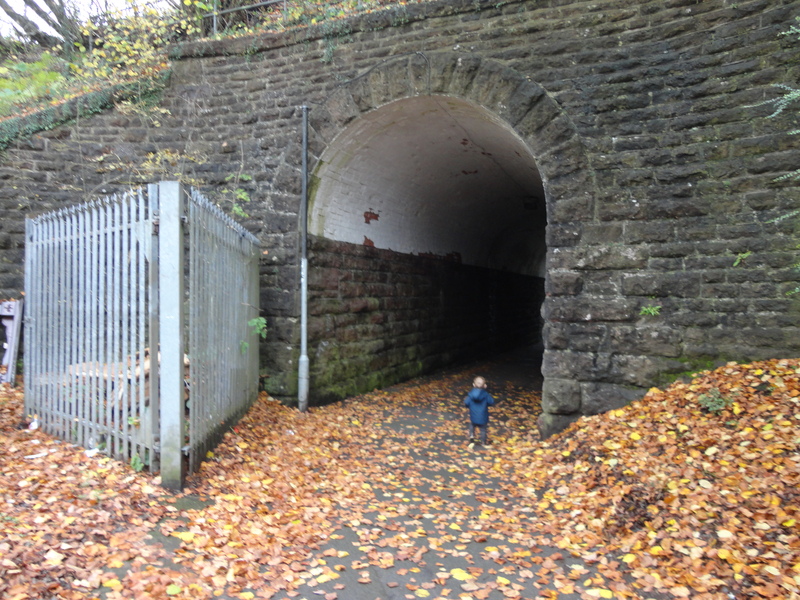 At the other end of the tunnel was Fidlas Road where Workman’s Garage and shop were situated. 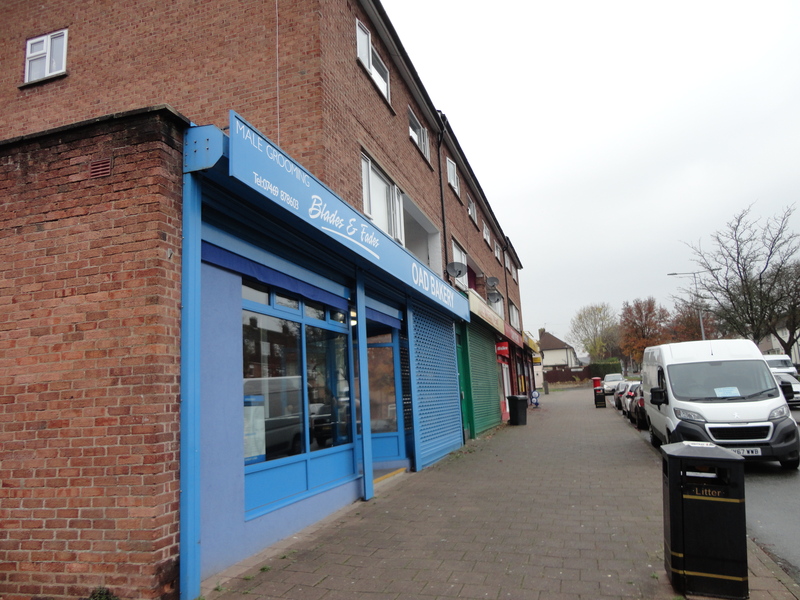 Further down Fidlas Road was The Salad Bowl, another shop we loved but never had much to spend there. We walked back down the gully, I noticed that they have fenced off the part where we used to climb up to watch the trains on the embankment. Probably not the safest pastime but we always loved it. When we headed back to the car, I noticed the old street sign had been moved. 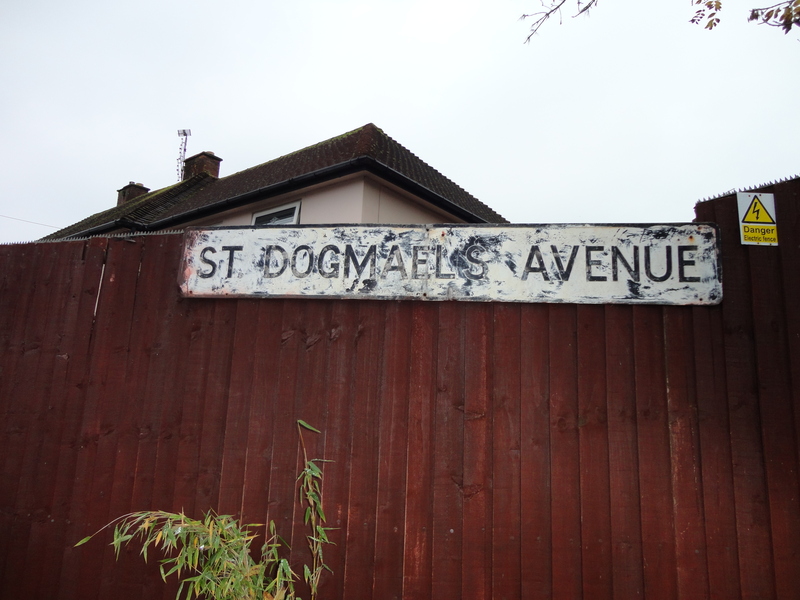 It reminded me how much I hated the name – St Dogmael’s Avenue. It’s horrible. 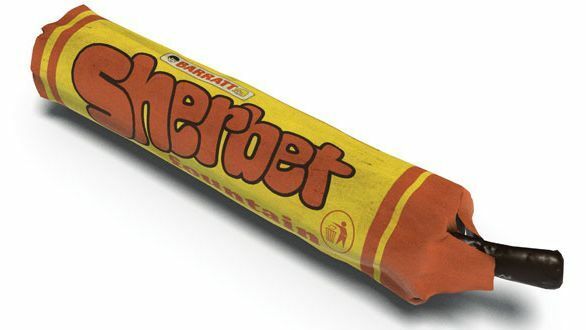 Its named after a pretty village in West Wales, as are Fishguard Road and Crundale Crescent but I hated it – and still do, I think! I was always so embarrassed, when I had to give my address in school, the other kids always used to laugh and start barking! It was a lovely return visit for me – for Max it was just a lovely walk around with his grandfather. He was on top form. So happy, so excited and so pleased (I hope!) to spend time with me. I so enjoy spending time with him! Next we were headed for the graves of my parents and parents in law, but had to call into Greggs en route – it would have been rude not to! When we reached the Cemetery, I turned around to find Max sleeping peacefully. 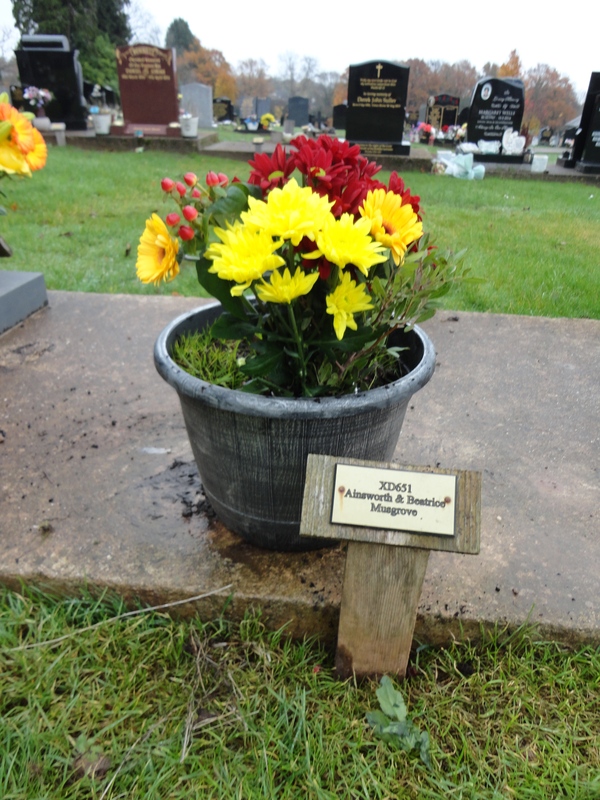 I didn’t wake him, much as I would like to have, but put flowers on their graves and wiped tears away as I reflected on the fact my precious parents and parents in law would never know my grandchildren – how they would have loved Max’s smile – but I never forget how much our parents did live to see. Max slept all the way home dreaming of trains probably and his family. He woke up when we arrived home and enjoyed his lovely lunch. I love you Max! Thanks for a great day. Oh how I enjoyed walking with you and Max this morning. Mum mum was from Barry and although she went to live in Zululand after she married my father, she never either forgot, or stopped telling everyone, whether they wanted to know or not, that she was Welsh. A staunch member of the Cambrian Society in Durban, she was thrilled when she was elected President of it. She was Carnival Queen in Barry in 1947. This lead to one of my nieces announcing in school in South Africa that her grandmother had been queen of Wales! Mum died 11 years ago today so how poignant your story arrived in my inbox today. Thank you for sharing your stories and for us being able to see your precious grandson, Max. How he will love these stories when he is older. Keep writing please! I love your memories shared with Max. Made me smile and a few little tears too. Phil spent quite a while growing up in Portfield Crescent. He would have loved this so much as he had a love of local history. I heard these stories countless times but I have a terrible memory so things are lost to me. I wonder if he told me about the Gleider field and the tunnel. Probably. Thanks for sharing. Thank you so much for your kind comments about my parents. My mother would have loved to think she was considered posh! I share your sentiments about a wonderful place to grow up. I lived in Fishguard Road from 1955 until I ran away to sea in 1972. I remember climbing up to the railway to put a penny on the line. I also remember a stone in the tunnel, on the left, approx half way to fidlas road which stuck out a little and had a groove in it which we used to lay bangers in.